Suffolk House Antiques | A 16th century Italian walnut credenza. A 16TH CENTURY ITALIAN WALNUT CREDENZA. Probably Tuscan, this walnut credenza is of typical form with two moulded front drawers, below a nulled frieze above a pair of panelled doors framed by relief carving and standing lion's paw feet. It is a useful size, 58 1/2 inches wide x 23 1/2 inches deep x 45 inches high. 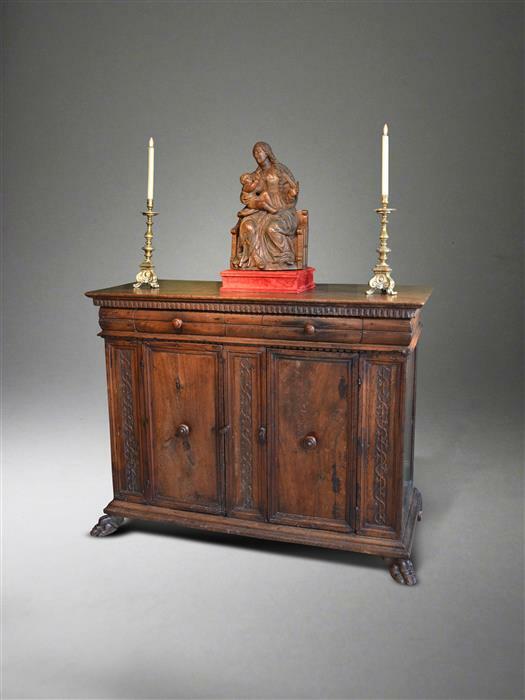 Some old restorations but a very good price for an attractive piece of 16th century furniture - £3850.